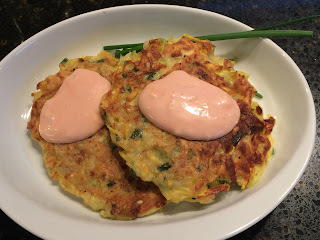 As the weather cools off our garden is at peak production, and so these crispy summer squash pancakes are yet another way to use some of our yellow crookneck squash. They were a great savory side dish and a nice accompaniment to our smoked country ribs. Fry Sauce* and extra chives for serving, if desired. 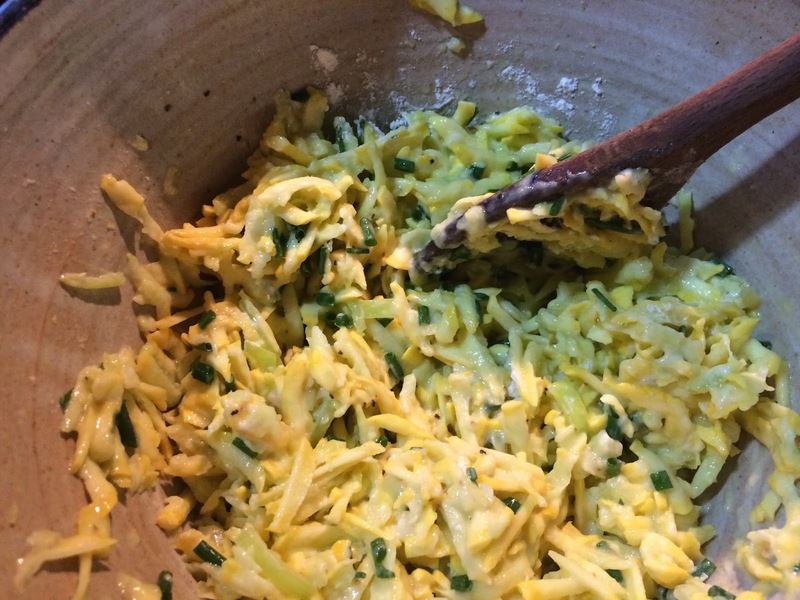 In a medium bowl, combine the squash, chives, jalapeno, egg, flour and baking powder. Season with salt and pepper and mix gently to combine. In a skillet, heat about 2 tablespoons of oil. Spoon heaping 1/4 to 1/3 cup mounds of the batter not the skillet and press lightly to flatten. Cook over moderate heat until golden, about 3 minutes. Flip the pancakes, add 1 tablespoon more of the oil if needed; cook until golden and crisp, about 2 minutes longer. Repeat the remaining oil and batter. Serve pancakes hot with a dollop of Fry Sauce* and chives. *Fry Sauce -- mix 2 parts mayonnaise with 1 part ketchup. Or, try our Zucchini Pancake recipe. Flip the pancakes, add 1 tablespoon more of oil if needed; cook until golden and crisp, about 2 minutes longer.